If this was correct, we would have a forty-ninth 4000-footer. We were having a conversation about a bushwhack with Steve Smith, owner of the Mountain Wanderer Bookstore in Lincoln, NH, and compiler and editor of the 30th Edition of the AMC’s White Mountain Guide. During our talk Steve broke out some maps as he’s been known to do, pointing out this or that to his customers. 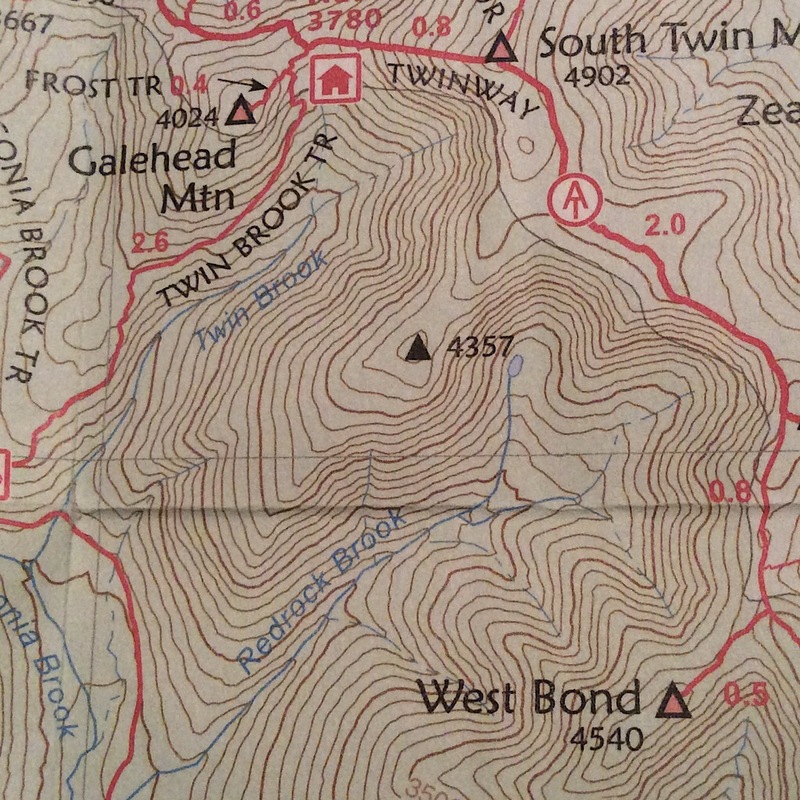 Using a copy of the Tyvek AMC map for the Pemi, Steve’s finger landed on a Trailwright’s summit — which has a 100-foot prominence rule for their list — we refer to as Southwest Twin. We quickly noted the elevation was greater than we recalled and asked about this peak’s prominence, innocently asking why this wasn’t a 4000-footer. Steve did a double take then fell silent before rummaging under the counter for a paper copy of what was allegedly the same map. On that copy the elevation was shown as 4357′ and was missing a contour line we could both plainly see on the Tyvek map. Steve muttered something along the lines of “shut the front door,” then looked at us, shocked, we daresay even a bit pale. That’s when it dawned on us the ramifications of this little discovery. If this was correct, we would have a forty-ninth 4000-footer. Steve picked up the phone and with a quick call to the cartographic services office at the AMC’s headquarters down in Boston — he has the number on speed dial — the person who answered the phone indeed confirmed our yet-to-be-announced findings (you heard it here first, folks). Shut the front door! Note the qualifying prominence of this now 4457-foot peak. 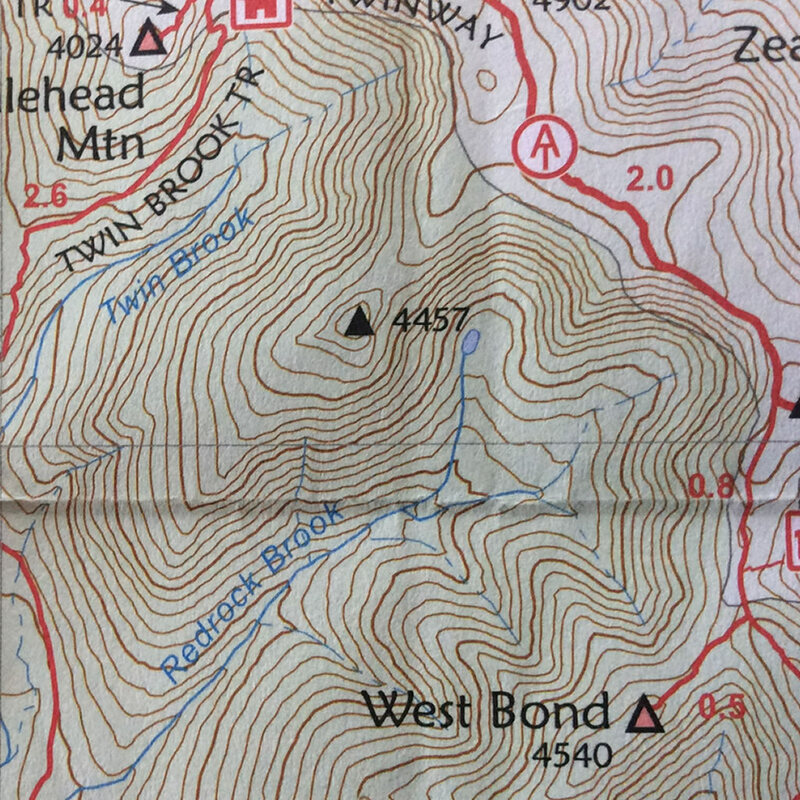 The contour interval is 100-feet on this AMC-produced map. This is the paper copy of what is supposed to be the same map. Note the glaringly absent 4300′ contour line. As Global Positioning System (GPS) technology improves, a more thorough and accurate understanding of our mountains is the result. Unfortunately there’s a down side: as we glean more accurate information about our surroundings, the information we once had becomes obsolete. Thus we have to adopt and embrace a newer understanding, bearing the cost of printing/buying newer maps as well updating the once-was on myriad levels. This includes the modification of our beloved hiking lists. Certification will no doubt be grandfathered… assuming you can live with that. For us, well, we’re off to hike a mountain.